46 Commercial Real Estate and Properties in Geelong are listed in 7 categories. We have 25 Industrial Warehouses for Sale & Lease , 17 Offices for Sale & Lease , 4 Retail Shops for Sale & Lease , 1 Commercial Farms for Sale & Lease , 1 Other Commercial Properties for Sale & Lease and 1 Hotels and Leisure for Sale & Lease . Expose your business to Derrimut's busiest intersection Warehouse/Showroom of 410 sqm Office of 100 sqm 6 car park spaces Easy truck access Security fencing Modern staff amenities Container height electric roller door Minutes to the Deer Park Bypass with easy connection to all the major arterials Call Helen Lipman on 0477 006 134 to arrange an inspection today! Office of 135m2 Warehouse of 1720m2 Mezzanine of 199m2 Total Area 2054m2 Modern staff amenities 2 container height electric roller doors High clearance clearspan warehouse On site car parking available Security fencing Minutes to the Deer Park Bypass with easy connection to all the major arterials. Contact Helen Lipman on 0477 006 134 to arrange an inspection today! Total area 403m2 Modern staff amenities On site car parking Main road exposure to Mount Derrimut Road Minutes to the Deer Park Bypass with easy connection to all major arterials Contact Helen Lipman on 0477 006 134 to arrange an inspection today! Premium Office Space Total Floor Area 59m2 Modern staff amenities Heating and cooling Balcony Across the road from Coles Supermarket, McDonalds, Nando's, Subway and all other conveniences. Call Helen Lipman on 0477 006 134 to arrange an inspection today! Premium Office Space Total Floor Area 93m2 Modern staff amenities Heating and cooling Balcony Across the road from Coles Supermarket, McDonalds, Nando's, Subway and all other conveniences. Call Helen Lipman on 0477 006 134 to arrange an inspection today! Electric roller shutter door Modern Kitchen, toilet & shower 3 Phase Power available Unit 8 Paramount Business Park Estate Ideal Investment for your Self managed Superanuation Fund Located within the Derrimut Village Shopping Centre Close proximity to Nandos, McDonalds, Subway, cafes & Coles. Minutes to the Western Ring Road and Ballarat Road, 10 minutes from the Airport & only 20 minutes to Melbourne’s Port & CBD Call Helen Lipman on 0477 006 134 to arrange an inspection today! INVESTMENT OPPORTUNITY Office/Warehouse/Showroom/Retail LEASED @ $45,000 PA 3 Year lease term Commenced 1st November 2018 with a further 3 years.Approx 6.5% return. Total Floor Area 470m2 Container Height Roller Door Easy Truck access Main road exposure Ideal for retail, bulky goods, showroom or office warehousing Call Helen Lipman on 0477 006 134 to arrange an inspection today! Total Area 148m2 On site car parking available Minutes from Deer Park railway station with easy access to all major arterials Contact Helen Lipman on 0477 006 134 for an inspection today! Total Area 127m2 Modern staff amenities On site car parking available Minutes to the Deer Park Bypass with easy connection to all the major arterials. Contact Helen Lipman on 0477 006 134 for an inspection today! Total Area 350m2 Modern staff amenities 2 Container height electric roller doors High clearance clearspan warehouse On site car parking Minutes to the Deer Park Bypass with easy connection to all the major arterials Contact Helen Lipman on 0477 006 134 to arrange an inspection today! Office/Warehouse/Showroom/Retail Total Floor Area 470m2 Container Height Roller Door Easy Truck access Main road exposure Ideal for retail, bulky goods, showroom or office warehousing Call Helen Lipman on 0477 006 134 to arrange an inspection today! Derrimut Industrial Office Warehouse For Lease Total Area 796m2 Contact Andrew Shields 04..
Office of 190m2 Warehouse of 606m2 Total of 796m2 Modern staff amenities Container height electric roller door High clearance clearspan warehouse Security fencing Easy truck access Located in the prestigious West Park Business Estate. Minutes to the Deer Park Bypass with easy connection to all the major arterials Contact Andrew Shields on 0408 443 202 for the results today! Office of 40m2 Showroom / Warehouse of 560m2 Total Area 600m2 Container height electric roller door High clearance clearspan warehouse 7 metre springline height Modern kitchenette and amenities 3 phase power available Main Road Exposure to Boundary Road Zoned Industrial 1 Ample on site car parking Minutes to the Deer Park Bypass with easy connection to all the major arterials Contact Helen Lipman on 0477 006 134 to arrange an inspection today! Warehouse/Showroom/Retail Total Floor Area 470m2 Container Height Roller Door Easy Truck access Main road exposure Ideal for retail, bulky goods, showroom or office warehousing Call Helen Lipman on 0477 006 134 to arrange an inspection today! Gross rental Sublease available Share with one of Melbourne's leading tenancies Flexible terms No amenities available / Warehouse only Site shed for an office is negotiable Warehouse of 2365m2 Security fencing Full drive around truck access Large canopy area 3 container height electric roller doors Contact Andrew Shields on 0408 443 202 to arrange an inspection today! Office of 150m2 Modern staff amenities Car spaces 5 Security fencing Contact Helen Lipman on 0477 006 134 to arrange an inspection today! Office of 34m2 Warehouse of 173m2 Total Area 207m2 Modern staff amenities Container height electric roller door High clearance clear span warehouse Ideal for tradies Security Fencing with Electric security gate On site car parking available 3 phase power available Minutes to the Princes Freeway and 500m to the Williams Landing train station Contact Helen Lipman on 0477 006 134 to arrange an inspection today! West Park Estate minutes to the Deer Park Bypass Office 74m2 Warehouse 126m2 Total Area 200m2 Modern kitchenette & staff amenities Motorized roller door access 3 phase power Zoned Industrial 2 4 on site car spaces Easy Truck access Room to drop 20 Ft container Floor plans available Contact Helen Lipman on 0477 006 134 for an inspection today! Total Area 160m2 Modern staff amenities On site car parking available Contact Helen Lipman on 0477 006 134 for an inspection today! 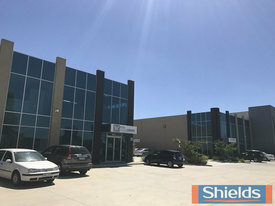 Expose your business to Derrimut's busiest intersection Warehouse/Showroom of 410 sqm Office of 100 sqm 6 car park spaces Easy truck access Security fencing Minutes to the Deer Park Bypass with easy connection to all the major arterials Call Helen Lipman on 0477 006 134 to arrange an inspection today! Warehouse of 356m2. Modern amenities. Container height roller door. 3 Phase power available. Well priced and positioned in the prestigious Paramount Estate, minutes from Ballarat Road and Boundary Roads with easy connection to all major arterials. Call Helen Lipman on 0477 006 134 to arrange an inspection today! Total Area 127m2 Modern staff amenities On site car parking available Contact Helen Lipman on 0477 006 134 for an inspection today! Total Area 128m2 Modern staff amenities On site car parking available Contact Andrew Shields on 0408 443 202 for an inspection today!